Q. I’ve read that I must have a 5′ turning radius in front of the copier and worktable. Is this required? A. No. You must have space for a turning radius in each room, and it can be anywhere in the room. There are no furniture-specific space requirements. 3′ clear across one long side of the worktable and the entire front of the copier is sufficient. Q. I keep getting an overlap warning on furniture that is clearly not overlapping. What am I missing? A. There is a bug in the practice software that causes a false overlap warning. NCARB hasn’t bothered to fix it. Q. Is it okay to have furniture behind a door? A. Only if you have access to that item without moving the door. Q. Is clearance required at the ends of the copier? Q. Can I place furniture in front of a window? A. Yes. Furniture heights and window sill heights are not provided. If it mattered, NCARB would have to say so. Q. Do certain pieces of furniture have to be grouped together? A. No. There is no evidence that this makes any difference at all. Q. 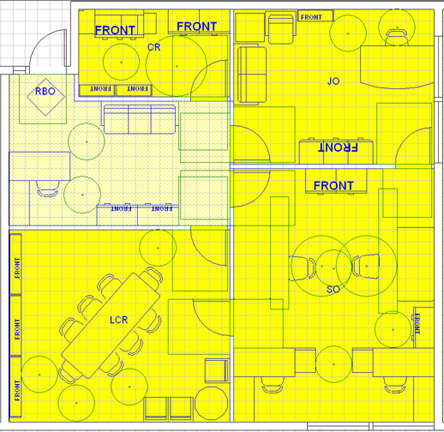 Can clear floor areas (CFA’s) overlap? A. Yes. They are just empty space. Q. Can the space for a turning radius overlap the door swing? A. Yes, but it cannot overlap the door itself. Q. Which way should the doors swing? A. Into rooms. A door between two rooms can swing either direction. Q. What does T44 mean? A. Abbreviation for Table For Four commonly used on this forum. Q. For furniture with chairs attached, do I measure 3′ from the desk/table or the back of the chair? A. Depends on the layout. You can measure from the desk/table if there is nothing behind/beyond that must be reached. Otherwise, measure from the back of the chair in order to get past it. Q. Does the practice software have a timer like the real exam? Q. Is it okay for a wall to intersect a window? Q. 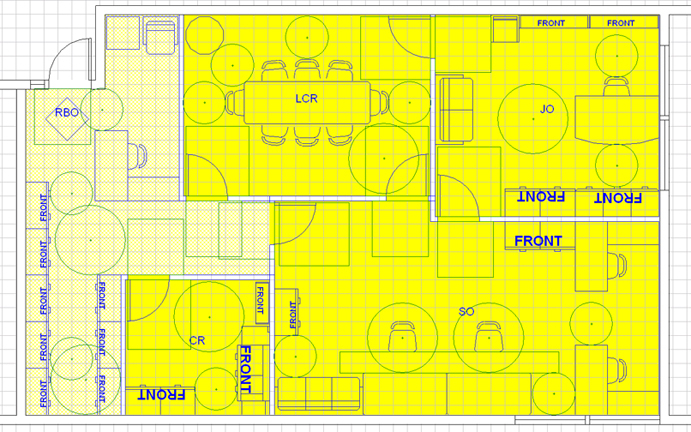 If I have a hallway/corridor in the suite, does it have to be 5′ wide and have a space for a turning radius? A. NO. There is no hallway or corridor in the vignette unless the program specifically indicates that you must draw one (unlikely). Space for a turning radius must be provided in each room, but it can be anywhere, and only one is required. Wheelchairs can back up. Q. Can an executive desk face a wall or have furniture in front of it? A. It should not directly face a wall. NCARB gave it a rounded front for that reason. You may place furniture in front of it as long as that furniture is still accessible. 1. Door conflict. A door swing cannot overlap the CFA of another door. 3. Inadequate access. Instead of dropping a 3’ diameter sketch circle into the plan, try sliding one through the plan. If it overlaps any object in order to reach another, clear access is not provided. The alternates listed above were not provided by NCARB or the owner of this site. In order to obtain the alternate furniture listed in the alternate programs, download the “C9TUT.AUT” file from the ftp (note: right-click and “Save Link As”). Replace your existing C9TUT.AUT file (the one you received when downloading the NCARB vignette program) with this new one. This file contains both the NCARB furniture and the alternate furniture. We updated the links, that’s for your feedback.